There is enough data to show that employee referrals are the best source of hire, are faster and less expensive to hire. Also, candidates hired through referrals tends to stay longer and hence reduce the employee turnover rate also. However, even with these clearly authentic benefits it is still one of the most underutilized sources of hires. Recruiters fail to maximize the benefits of employee referral as they treat it as an organic source and therefore do not put in the required efforts and strategy to motivate employees to provide more great referrals. Sometimes it is the same set of 10-20% employees providing referrals while other 80% of the employees remain inactive. As a recruiter how can you change this? Let’s find out. If you want to increase your employee referrals, you must provide an optimum user experience. The easier it is to provide and track referrals for employees, the more often will employees participate in your employee referral initiatives. While using a tool can definitely help, even if you do not use dedicated software for it, make sure to design your referral program in a way where it is easy and quick to submit a referral, track the status of the referral and track the incentives pay out. With these three main aspects taken care of, you are well on your track to improve the chances of getting referrals from your employees. However, if employees have to spend half an hour of their time to place a referral, you can be sure that it won’t attract many participants. Therefore, focus on making the process smoother and simpler in order to give your program maximum organic reach. 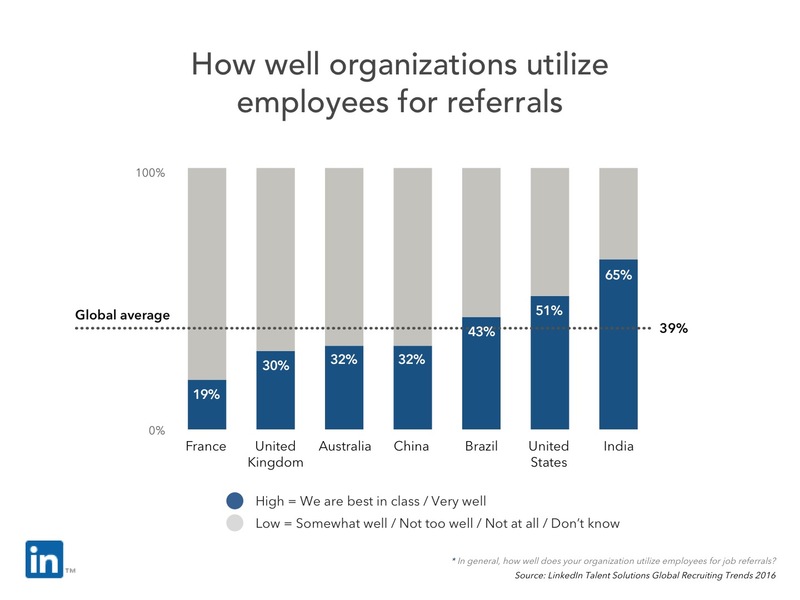 Also Read: Why Employee Referrals are the best source of hire? Companies with strong employer brands get more job apply and hire better quality talent. Branding has a major role to play while running an employee referral program also. Company events like job fairs, or other volunteering events, play an important role not only in improving the branding, but also impacts the synergy within employees. With such bonding, employees tend to be happier and more productive. Such activities promote positive brand awareness within the team and inculcate a desire to get their friends and professional connections to work for the company. When there’s a company opening, employees will naturally want their connections to apply. In addition to marketing your brand, it is also essential to market the referral activities you are conducting. Use the help of your marketing department to design campaigns that can encourage employees to participate in the referral program. Focus these campaigns on various benefits that employees can experience by getting their referrals hired in the organization. These regular email campaigns will keep the referral process top-of-mind for all employees, which makes it that much easier for them to take part in it. Offering monetary bonuses to incentivize referrals is a tried and tested method to get more referrals from employees. However, make sure that the bonuses are high enough to incentivize the work, but not so high that the ROI cannot be justified. Also, too high monetary rewards often increase the number of referrals but impact the quality of those referrals negatively. You would surely not want to screen through hundreds of profiles submitted by employees to find only one or two relevant candidates. In addition to monetary bonus, even a simple ‘thank you’ mail can go a long way towards motivating employees to continue referring candidates. A company meeting, in a company-wide email, or on the employee referral site, there can be different channels through which you can convey this ‘thank you’ message. Other non-cash alternatives include a weekend getaway, movie tickets, a fully paid meal for family at a local restaurant, or tickets to a local event. Gamification inculcates a feeling of healthy competition, which if often more effective than money at driving employee engagement and participation. You can create a public leaderboard on your employee referral website to show which employees have provided the most number of referrals successfully, or reached out to the most people in their network. Such social rewards become a motivating force for employees to take continues interest in the referral program. An automation tool like Applicant Tracking System (ATS), makes referral management very simple and efficient. You can use the ATS to create a centralized database of all the received referrals, and track them to their sources. Dedicated employee referral software, like Naukri RMS Referral is still a better option as it will provide you advanced referral management capabilities with comprehensive reports and analytics to identify the bottlenecks in your referral program and improve them. The referral software will save you from wasting time in switching back and forth between emails to get, view, and share all the referred profiles. It will allow you to easily evaluate the performance of the program and spot areas that need improvement. Referral technology like RMS Referral requires minimal effort to setup and provides complete transparency and visibility over the performance of the referral activities and keeps the employees engaged. With its robust features, you can quickly improve the participation rate of the employees and get more quality referral candidates. https://companies.naukri.com/rms-careers/wp-content/uploads/sites/21747/2019/01/how-to-encourage-employee-referrals1.jpg 384 959 Naukri RMS Naukri RMS2019-01-12 04:42:362019-01-14 05:07:29How to Encourage Employee Referrals? Employee Referral is one of the most reliable sources of hiring as the candidates hired through referrals stay longer and generally perform better than their colleagues. Therefore, any smart recruiter would try to maximize the number of candidates he could gain through employee referrals. However, the big challenge that HRs face is getting employees to refer candidates. Can referral software change that? Let’s examine. Why do employee referrals not work? Why implement an employee referral program? There is no arguing to the fact that employee referral is the solution to every recruiter’s woes. Search about employee referrals and you will chance upon not one but many researches and surveys that confirm the superiority of employee referrals as a source of hiring over all other sources. Let us have a look at some statistics in this context, all of them available in the public domain. This report based on a sample of more than 440,000 job interview reviews presents numerical evidence on how different sources of interviews impact the chances of a successful job match. The research concluded that employee referral is most likely to lead to an accepted job offer, with the probability of successful job match rising by a significant 2.6 to 6.6 percent. However, referrals account for a meager 10 percent of reported job interviews whereas 42% of hired candidates applied online. 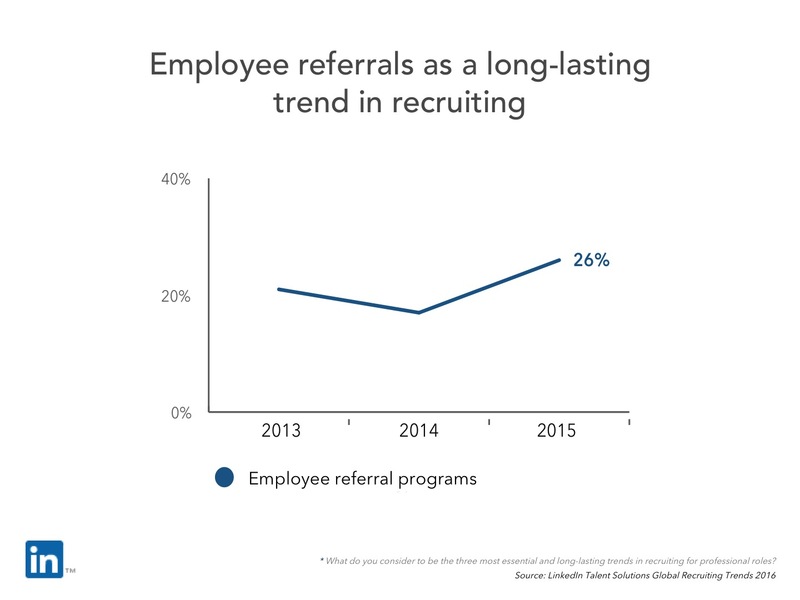 Employee referral reigns as the best source of hiring. It is also the top internal source of hire with a 45% success rate which is a 5% increase from last year. Referred employees have lower recruiting cost, higher productivity and impact the entire workforce in a more positive manner as compared to employees hired from any other source. 32% companies reported employee referral as their top source of quality hires. Another 26% consider employee programs to be a long term trend. Owing to their long lasting impact, there is an increasing need to invest more time and resources in strengthening referral programs. The worrying aspect of the report is that currently only 8% have realized the full potential of their employee referral program while an average of 39% talent leaders have high usage pattern. India finds itself at top, above USA in utilization of employees for job referrals as shown in the graph. The comprehensive research points towards the utility of employee referral as a best in class strategy to hire new employee during the recessionary periods. The various benefits elicited in the report confirm the trends of other researches in this direction, i.e referrals are gold for recruiters. They are number one source of hiring quality candidates, lead to greater retention and also the “most productive” source for diversity hires, against the common perception that referrals have a negative diversity impact. Yet, employee referrals are only 6.9% of the total job applicants. Despite being a mine of quality talent, why employee referrals lag behind other sources when it comes to the number of job applications? Clearly, recruiters are either lacking in tools or application of best practices when it comes to attracting more employees towards providing quality referral candidates for a vacant position. First of all, recruiters have to effectively communicate with their employees of job openings. It’s quite common to find employees having little or no awareness regarding the current openings in the organization due to absence of any form of active engagement between employees and the HRs. To be honest, employees cannot be blamed for low referral generation if they are not kept actively engaged on an ongoing basis. This problem can be solved to a great extent if we automate the entire process using a referral tool. Secondly, there is not enough motivation for employees to refer a candidate. To find a suitable match for a particular role, an employee has to leave their daily work schedule and dedicate time specially for reaching out to their network, get back responses and then hand over the CVs to recruiters either manually or through emails. Motivation can be in many forms and not necessarily monetary. In fact, recruiters at Google found that increasing bonus compensation had little effect on referral generation. Increasing employee engagement is the path to success, which can be achieved with greater effectiveness through devising and deploying gamification strategies and increasing communication and transparency between employee, referred candidate and the HR. Providing regular status updates to employees on their referred candidate and speeding up the interview schedule are just two simple ways of ensuring that everyone has a pleasant experience. Another problem that limits the number of referrals is a long and cumbersome process, which creates a disinterest amongst the employees for taking up the task of referring their friends or professional networks. The manual process which requires employees to draft messages and contact members of their network and then forward CVs to recruiters is a long and archaic one. Most employees simply don’t have that kind of time at hand. All of the above discussed bottlenecks can be overcome through deployment of a dedicated employee referral tool/software. Such a recruiting technology can help HRs in spreading the word about a vacancy quickly, manage the responses without losing their mind and also schedule interviews as soon as they receive an application. Many of these referral solutions come embedded with advanced gamification and other engagement tactics like leaderboards which can provide the much needed motivation to employees for making their next referral. Even keeping a track of the status of the referred candidate in real time is possible for both the employee and the recruiter using these solutions. Tapping into the social networks of employees is the key to building next generation referral programs. While manually it can be difficult to persuade every employee to share a particular job listing in their social network, this objective can be achieved easily by providing a sharing mechanism like a button or widget in the automated emails sent by these tools. The software is essentially making the sharing easy by helping the employee instantly post the job to social media without even typing a word. This serves two fold objectives. Even if none of employee’s friends apply to the job, it can be further shared by their connections on their own social media profiles and software can track the referral back to the original publisher and reward them. One of the biggest advantages of these solutions is that they can be used on any computing device ranging from a desktop to smartphones. With the mobile integration capability, the software makes it possible to share jobs and track referrals on mobile computing devices as well. All these benefits make a strong case for using an automated referral solution for maximizing the success of your next employee referral program. What do you say?